Buford Betty: I ain't no plastic bag. On my weekly grocery marathon yesterday, I learned that Wal-mart is soon going to ditch the plastic bags altogether. Not sure if this is just Super Wal-mart we're talking about or all Wal-mart stores, but anyway - I was intrigued. In an effort to encourage the use of reusable shopping bags (and help their bottom line, no doubt), they will be getting rid of the plastic grocery bags and will only have paper ones available. But customers will only be allowed 3 bags before they start charging (per bag). Now keep in mind this info all comes via a convo overheard between my cashier and bag boy as they're examining my super cool reusable bags that I got at Pier 1. I have no reason to doubt this information though... my cashier was complaining about all the whining he expects to get from customers. And I wouldn't be surprised to see this start happening at other stores soon enough. - Trader Joe's - OK yes, I know this is technically a grocery but it doesn't count. I think of it more as a specialty store and besides, they have some uber cute bags - all different kinds - for really cheap (only $1 or $2). - IKEA - You gotta do a little hunting (and also take a valium before going), but they have lots of good bags in all different sizes - and for stoopid cheap of course. - Pier 1 - I found some super cute ones in here for $2 and $3. - I can't vouch for this as I haven't been in a while, but another place worth looking would be Cost Plus World Market. I'm SURE they have some... totally sounds like something they'd carry, doesn't it? What cool bags have y'all found? I totally have more than enough but I have a weird obsession with these bags! I just keep buying more! I ADORE my Trader Joe's 6 bottle wine tote. It's pretty much the Bee's Knees. Also, I remember how hard it was to come by that AnayAnya Hindmarch last year. She is too brillant for words. Too funny aeg... I totally almost bought that tote last time I was in Trader Joe's. I think walmart is using going green as an excuse to charge customers for bags. I load up when I venture to Wally World, but might consider shopping somewhere else if they are going to be picky. I use the reusable bags at other stores, but I would need like 20 for my walmart excursions. 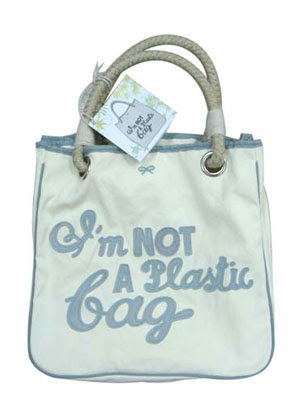 Love the "not a plastic bag!" I've seen them around and have thought about getting one -- now I'm sold! By the way, I have something for you on my blog. Right now, I've got a mix of the boring Kroger, Wal-Mart, and IGA canvas bags. I'm on the hunt for some more stylish bags, so I'll certainly check out the places that you suggested. Thanks! I am so with you on not wanting to buy one stores bag b.c I shop all over. So I went to Hobby Lobby and got my own bags and decorated them myself. A fun little craft project. I love the "not plastic" bag as well! I loaded up on green bags from Publix though bc they were ONE PENNY a couple of weeks ago! Target has some cute ones but they are more like 10 bucks ... too much when you need at least 5! TJ Maxx also has some for a buck - not very cute ones though. I picked up some of Target's big ones- they are only $1.50 and hold A LOT. I've got two, and pretty much can fit my $150 shopping trips in them, no problem.